Say hello to your spiritual wellness necessities. We all need to take some “me time” every once in awhile to reflect and meditate on what’s going on in our lives. 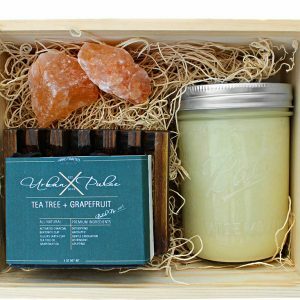 This kit gives you the chance to light a candle for relaxation and ambiance. Soak in a warm tub with a bath fizzy that with nourish your skin. And provides you with a useful home decor piece to store your matches. So you can take a step back for the night, clear your mind of worries and set intentions for the week ahead. Enjoy! 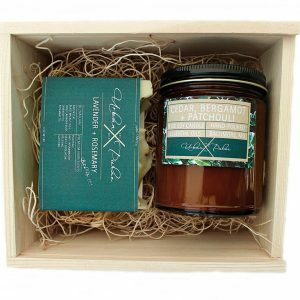 Pure soy wax provides a clean, naturally burning candle free of harmful toxins, carcinogens and pollutants. Match strikers provide a cute, functional place to store matches, trinkets or tealight candles. Use “anywhere matches” to strike the un-glazed side of these pots and light your match! 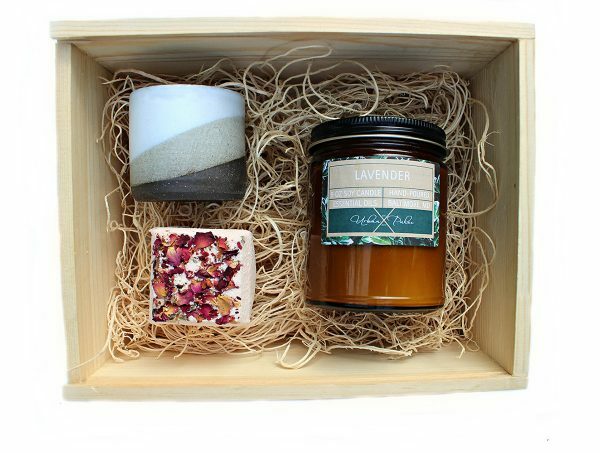 Gift Sets Includes: (1) 9 oz soy wax candle of your choosing, (1) Match Striker and (1) bath fizzy of your choosing in a wooden gift box with detailed product descriptions.